Switzerland took a huge step towards the last 16 of the World Cup as Xherdan Shaqiri scored a brilliant solo 90th-minute winner against Serbia. The Stoke City player collected the ball near the halfway line before dribbling away from the defence and slotting past Serbia goalkeeper Vladimir Stojkovic. 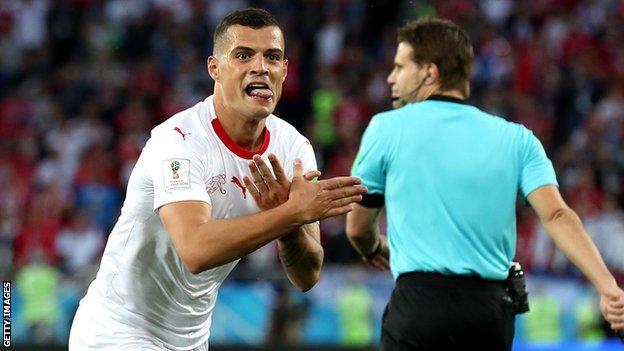 Granit Xhaka had scored a brilliant equaliser for Switzerland after Aleksandar Mitrovic put Serbia in front with a header in the fifth minute. Serbia, who had a strong claim for a second half penalty turned down, had dominated the first half, knowing a win would have confirmed their place in the knockout stages. Switzerland are now level with Brazil on four points at the top of Group E, in second place due to an inferior goal difference. They will qualify for the last 16 with a draw against Costa Rica, who have already been eliminated, in their final game. If Switzerland win, Serbia must beat Brazil in their final game to progress. Switzerland had been outplayed in the first half as they struggled to create going forward and seemed unable to contain constant Serbia attacks. Swiss striker Haris Seferovic was substituted at half-time having had just five touches and that move seemed to spring Switzerland into life. Xhaka drove a powerful strike from the edge of the box past the stranded Stojkovic to equalise in the 52nd minute and soon after Shaqiri hit the post with a curling effort from the edge of the box. Shaqiri was far more influential in the second half – capitalising on poor defending for the winning goal when Serbia left themselves exposed at the back as they pushed for a winner of their own. The forward was left one-on-one with Dusko Tosic on the halfway line and he was too quick for the Serbia centre-back after Mario Gavranovic found him with a throughball. Shaqiri and Xhaka celebrated their goals wildly – strikes made even more emotional as both are of Kosovan descent. After the break-up of the former Yugoslavia in the 1990s, Serbia responded to separatist pressure from Kosovo by launching a brutal crackdown on the territory’s Albanian population, which ended with Nato military intervention in 1999 – while the country became independent from Serbia in 2008. Xhaka’s father spent three and a half years as a political prisoner in Yugoslavia while Shaqiri was born in Yugoslavia before emigrating to Switzerland as a child. Both appeared to make an eagle gesture with their hands as they celebrated, a symbol of the two-headed eagle on the Albanian flag. Shaqiri also sported a Kosovan flag, stitched onto his boots, and was booed by the Serbia fans when his name was read out before kick-off. Asked about his players’ celebrations, Switzerland’s Bosnian-born manager Vladimir Petkovic said: “You should never mix football and politics, it’s important to be a fan, and to give respect. Serbia had impressed in their opening-round win over Costa Rica, and in the first half against Switzerland they produced one of the most potent attacking displays seen so far in Russia. Mladen Krstajic’s side were led by the impressive Mitrovic whose goal was his 18th in 26 games for club and country in 2018, having impressed in helping Fulham achieve promotion from the Championship during a loan spell last season. The striker had already shown his aerial prowess moments before he headed in Dusan Tadic’s cross when he forced a good save from Swiss goalkeeper Yann Sommer. He also set up Tadic for a chance shortly before the break and even tried an ambitious overhead kick as he brimmed with confidence. After the break Serbia did not have the same control of the game but Mitrovic still could have won a penalty midway through the second half. Two Swiss defenders appeared to have hold of his shirt as he challenged for the ball but the referee waved away the appeals and did not view the touchline monitor for a video review. Switzerland’s 2-1 victory over Serbia is the first game at the 2018 World Cup to see a side win from a losing position. As an independent nation, Serbia have lost each of the six World Cup matches in which they have conceded. Switzerland have lost just one of their last 24 matches (W17 D6), a 2-0 defeat to Portugal in a World Cup qualifier in October 2017. Switzerland have conceded a goal in three consecutive World Cup games; they had only conceded in three of the previous 10 before this run. Stephan Lichtsteiner made his ninth World Cup appearance for Switzerland in this game – the most of any Swiss player in history. Aleksandar Mitrovic has been directly involved in 15 goals in his last 15 starts for Serbia (13 goals, 2 assists). Five of Granit Xhaka’s 10 goals for Switzerland have come from outside the box. Only Josef Hugi (6 goals) has scored more World Cup goals for Switzerland than Xherdan Shaqiri (four, tied with Robert Ballamann and Andre Abegglen). Shaqiri has been directly involved in five of Switzerland’s last six World Cup goals (four goals, one assist). Match ends, Serbia 1, Switzerland 2. Second Half ends, Serbia 1, Switzerland 2. Attempt missed. Xherdan Shaqiri (Switzerland) left footed shot from outside the box is close, but misses to the left. Assisted by Mario Gavranovic. Foul by Xherdan Shaqiri (Switzerland). Corner, Switzerland. Conceded by Nemanja Radonjic. Substitution, Switzerland. Josip Drmic replaces Steven Zuber. Mario Gavranovic (Switzerland) wins a free kick in the defensive half. Xherdan Shaqiri (Switzerland) is shown the yellow card for excessive celebration. Goal! Serbia 1, Switzerland 2. Xherdan Shaqiri (Switzerland) left footed shot from the left side of the box to the bottom right corner. Assisted by Mario Gavranovic following a fast break. Fabian Schär (Switzerland) wins a free kick in the defensive half. Corner, Switzerland. Conceded by Branislav Ivanovic. Aleksandar Mitrovic (Serbia) is shown the yellow card. Foul by Sergej Milinkovic-Savic (Serbia). Corner, Serbia. Conceded by Manuel Akanji. Attempt blocked. Manuel Akanji (Switzerland) left footed shot from the centre of the box is blocked. Attempt blocked. Breel Embolo (Switzerland) left footed shot from the centre of the box is blocked. Assisted by Ricardo Rodríguez with a cross. Corner, Switzerland. Conceded by Aleksandar Mitrovic. Attempt blocked. Ricardo Rodríguez (Switzerland) left footed shot from outside the box is blocked. Xherdan Shaqiri (Switzerland) wins a free kick in the attacking half. Foul by Nemanja Matic (Serbia). Attempt saved. Mario Gavranovic (Switzerland) right footed shot from the centre of the box is saved in the bottom right corner. Assisted by Breel Embolo. Attempt missed. Xherdan Shaqiri (Switzerland) left footed shot from outside the box is too high. Attempt saved. Breel Embolo (Switzerland) right footed shot from outside the box is saved in the top centre of the goal. Assisted by Steven Zuber. Substitution, Serbia. Nemanja Radonjic replaces Luka Milivojevic. Foul by Ricardo Rodríguez (Switzerland). Aleksandar Mitrovic (Serbia) wins a free kick on the right wing. Attempt blocked. Adem Ljajic (Serbia) right footed shot from the left side of the box is blocked. Assisted by Aleksandar Kolarov. Offside, Switzerland. Xherdan Shaqiri tries a through ball, but Mario Gavranovic is caught offside. Substitution, Switzerland. Breel Embolo replaces Blerim Dzemaili. Xherdan Shaqiri (Switzerland) wins a free kick in the defensive half.